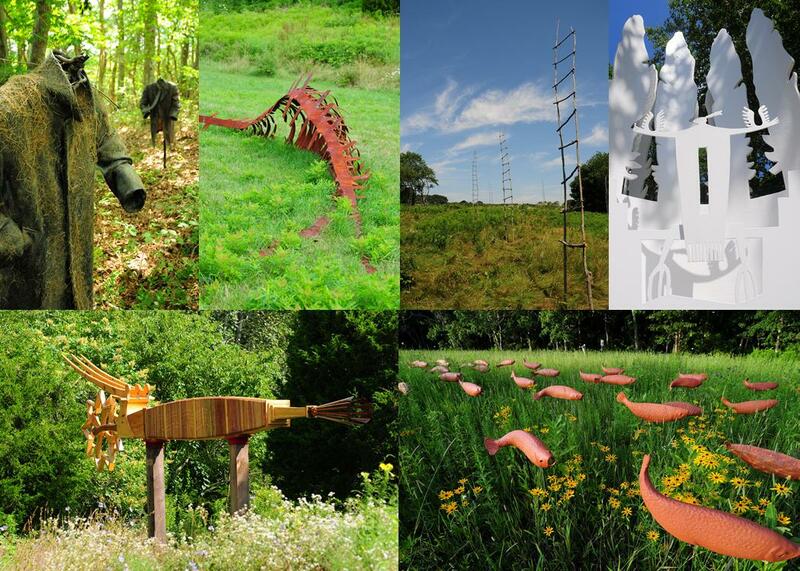 Dartmouth Natural Resources Trust (DNRT), The Trustees of Reservations, UMass-Dartmouth and the Gustin Gallery are once again collaborating to display large site-specific outdoor sculptures on the Slocum’s River Reserve natural area in Dartmouth, Massachusetts from June 20, 2015 through June 10, 2016. The overall goals of “The River Project” are to provide an inspirational and enjoyable free outdoor experience for people of all ages, to increase public interest in and support for art & natural areas, and to stimulate a dialogue about art and nature and the connections between them. In conjunction with the sculpture exhibit at the Slocum’s River Reserve, drawings, sketchbooks, models and other supporting materials created by the artists will be shown June 20, 2015 through September 27, 2015 in an exhibit at the Gustin Gallery, located at 231 Horseneck Road, just north of the Slocum’s River Reserve. “Magical, creative and spiritual surprise at every turn! Based on the enthusiasm generated by the first River Project, a second River Project was held between June 2012 and May 2013, featuring works of another six artists selected by a committee that included some of the original six artists. Once again, the project was a huge success, with an estimated 20,000 people visiting the Reserve over the course of the year, including hundreds of schoolchildren. Photographs of The River Project 2009 & The River Project 2012 can be viewed here. In August 2013, an organizing committee was formed for The River Project 2015, and five new artists were selected in April 2014 based on an invitation-only request for proposals. Where was the Slocum’s River Project 2015 RFP advertised or was the selection of artists by invitation only? A targeted Google search did not show any recent articles or notices regarding application or submission requirements. Artists were invited to apply by invitation only. Artists were invited (and ultimately selected) by an artist selection committee that included project partners and past artists.